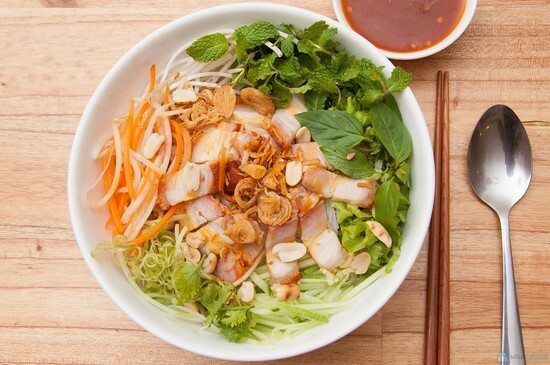 A comprehensive list of Da Nang food to go & eat, plus top best restaurants. Da Nang is blessed with not only beautiful beach and stunning scenery thank to favorable geography position also unique cuisine which is made by the local people. Da Nang street food plays certain part in reflecting the rhythm of life as well as special gastronomy of people in there. Originated from Quang Nam province, Quang noodle is made with rice noodle and variety of herb, lettuce and the flower of bananas. Interestingly, there are three kinds of Quang noodles served with different types of broth. Broth can be made by simmering pork and tibia shin, chickens, or snakehead fishes seasoned with salt, sugar, black pepper, shallot, garlic and lemon grass. The people living in central Viet Nam put Quang noodle into a big bowl, peanut and Vietnamese crackers are sprinkled after pouring broth. The broth must have strongly flavor and only a small of it is used to wet the noodle. 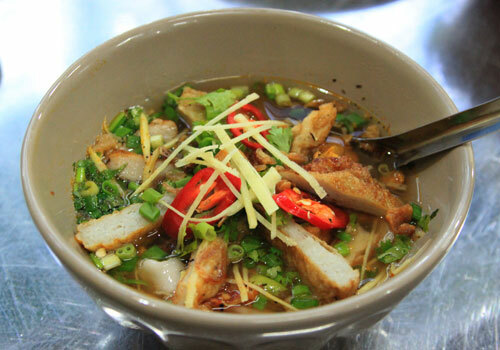 A bowl of fish cake noodle is full of broth which is experienced the sweetness of fish, pumpkins and pineapple. 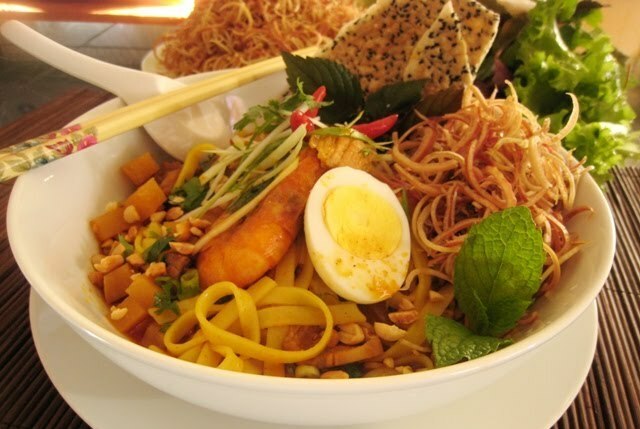 Due to locating in coastal area, Da Nang profit fresh abundant seafood sources every years, fish cake noodle is special gift of nature. Amazingly, shrimp sauce also is added yourselves to stimulate the flavor of broth after the chief prepared for you a bowl of noodle soup. Bun mam is made out of vermicelli, pork or roasted pork, vegetables, unripe papaya, peanuts and, of course, anchovy fish sauce. As the name suggests, the exquisiteness of this dish depends mostly on its anchovy fish sauce. Originally Bun mam is accompanied with boiled pork, and other alternatives include roasted pork. Additionally, bun mam is served with “mít non” (unripe/young jackfruit) and the special chilli sauce which are trademarks of the central region. The sweet soup carts are now appearing on the busy streets of Hoang Dieu, Bach Dang, Phan Chu Trinh, Pasteur, Nguyen Chi Thanh. Some popular sweet soup such as: Che bap (corn), che troi nuoc (sticky rice cake and green pea paste), che khoai (taro), che dau ngu (kidney beans sweet soup), che dau xanh (green bean), che dau do (red bean), che bot loc (cassava) and so on. These kinds of sweet soup are usually served smoky hot. The sweet soup is surely great food to go in Da Nang. They are all ready to go food shop in Da Nang. 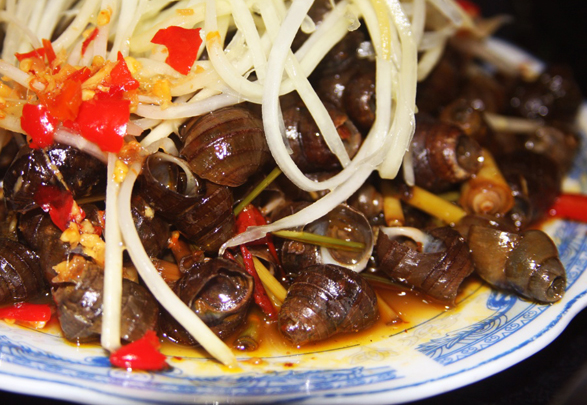 In the evening, walking on foot along Han river or Le Duan street is fantastic ideas to explore the flavor of Da Nang spicy snail for fresh wind night. People can not conceal their craving for this street food. Various types of escagots are cooked in different styles, but the most popular is small escagots are processed with lemongrass and chili. Taking a snail and sucking the smaller end of the shell before sucking the opening. However, if you can not take it out and heat your lip owing to spiciness, a toothpick is used to solve this problem. That is reason why Vietnamese named Da Nang spicy snail is OC HUT. 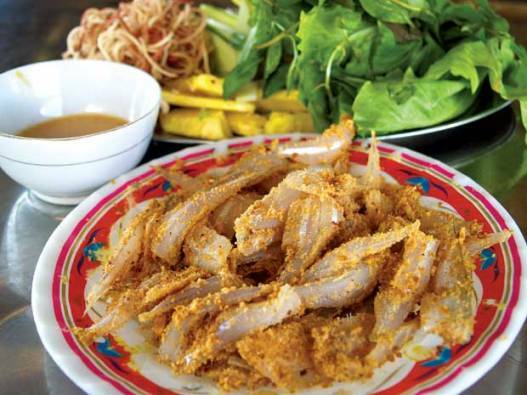 Nam O raw fish salad is the specialty of rich Danang cuisine culture. Raw fish salad can be prepared from sardines, “tớp” fish, anchovies … but tasty and most appropriate herring. Herring larger fingers, cut the head, tail, belly, boneless, splitting itself into two pieces and sliced marinated with ginger, galangal, garlic finely chopped and milled rice flour. Vegetables served with raw fish that are so diverse and special rare. This is the bud of “coc rung”, “tim lan”, “lành ngạnh”, “tram”, “dung” leaves… This species grows only on the Hai Van Pass, so sellers have to bring the forest to collect. The meat is sweet cool, deep sauce, the galangal, chilli fragrant, scented with the fragrance of forest leaves, green banana pieces together more acrid, bitter … tasty as it enters the roots, the beginning tongue, running straight down to the stomach. 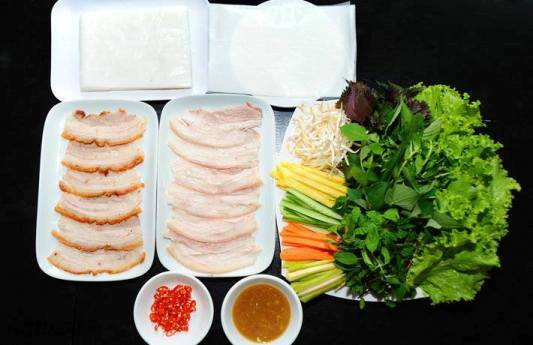 Pork rice paper is a typical dish when talk to Dang food. This is a dish need very fresh ingredients. Pork should choose pork just cooked to medium boil, let cool , and cut into long thin slices . In particular, raw vegetables must be over 10 to be considered kind. “Bánh” is a Vietnamese term, translating loosely as “cake” or “bread”, that refers to a wide variety of sweet or savory, distinct cakes, buns, pastries, sandwiches, and food items from Vietnamese cuisine, which may be cooked by steaming, baking, frying, deep-frying, or boiling.